UCOER Pune (Universal College of Engineering & Research), Pune Published Job Notification for Assistant Professor Posts. Candidates who wish to apply must look at UCOER Pune Assistant Professor Recruitment 2018. Eligible candidates can join Walk-in Interview on 02-07-2018. 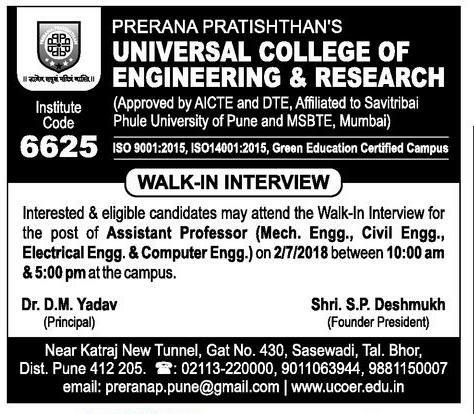 Interested & Eligible candidates may attend for walk in interview along with all the documents addressed at Universal College of Engineering & Research, Sr. No. 430, A/P Sasewadi, (Near Katraj New Tunnel), Taluka- Bhor, Dist. Pune, Pune, Maharashtra 412205. Starting Date, Last Date to Apply Offline at Universal College of Engineering & Research which candidates should be remembers as follows.